The hazmat team responded promptly to a chemical that has a growing popularity in the news, ammonia. The slow leak at Rio Grande Cold Storage was coming from a compressor in the north end of the building. The company stores mostly grapes and the hazardous material, ammonia, is used in refrigeration. The workers in the facility were evacuated for precautionary measures. Ammonia is very toxic and corrosive. Ammonia leaks call for barriers of at least 150 meters away from the hazardous material. Wind direction is very critical to the hazmat site and it determines what is blocked off. The Tulare County Fire Department public information officer, Mike Green, stated, “Ammonia is corrosive… It can do terrible things to your lungs”. The hazmat team responded to the scene quickly with a backup hazmat team for assistance if anything went wrong. Ammonia is a strong, colorless gas that is very corrosive and flammable. Ammonia is widely used in industrial refrigeration applications due to its low costs. The hazardous material is very toxic and exposure to high concentrations can lead to death. Symptoms can include breathing difficulty, irritation of nose, throat, eyes and can cause burns and blisters. Ammonia should be stored in a fully compliant chemical storage building. Ammonia is flammable so utilization of a fire-rated chemical storage building may be necessary. Flammable chemical storage buildings are completely compliant and will offer protection for ammonia storage. 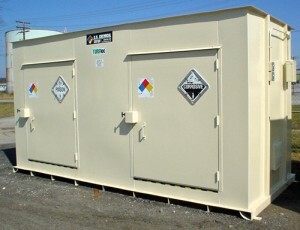 U.S. Chemical Storage provides fully customizable flammable chemical storage buildings for ammonia storage. Our explosion proof parts and accessories are also available with our flammable chemical storage buildings. Made from heavy-duty, metal steel construction for superior strength. Our flammable chemical storage buildings provide the ultimate protection and safety for your ammonia storage.